Welcome to McCann Forest Products. McCann Forest Products is a small company servicing the Ottawa Valley's local market but still large enough to deliver truck load orders. We deliver on competitive pricing and fast service, so feel free to call anytime with you questions. Tom McCann was born and raised in Pembroke, Ontario. Tom, like many of the area’s youth, left for university and life experience. After traveling and working in different areas, he knew he wanted to raise his family in the Ottawa Valley. 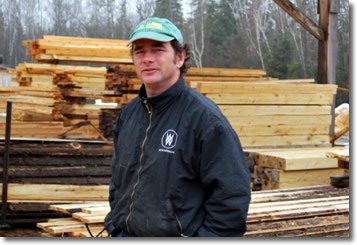 In 2002, he returned and bought a sawmill as an income supplement but realized he wanted more and started his full-time operation – McCann Forest Products - in 2006, after becoming a certified hardwood lumber grader. Tom works exclusively with eastern white cedar that grows in our area. Studies have shown that eastern white cedar, untreated, has the best natural resistance to decay of all Canadian softwood species. 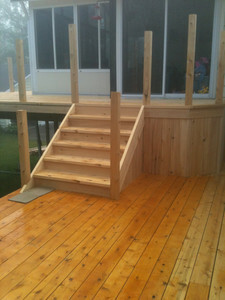 Tom saws and sells cedar lumber for virtually every outdoor need: decking, fencing, pergolas, gazebos, sheds, posts, retaining walls, raised garden beds, railings, stair treads, balusters and facia. He does custom work as requested and sells lumber in all quantities. McCann Forest Products has recently become FSC certified, to provide his customers with the assurance that the cedar he makes into lumber comes from sustainable sources. Tom also sources his wood from local woodlots. Tom’s office and mill yard is located just outside of Eganville, at 897 Letts Cemetery Road. You can buy directly from him by calling (613-633-3911) or emailing (contact@cedartom.com).